Unlike Stormy, I usually forget about setting resolutions. By the time January 1st passes, I am still catching up on my normal tasks such as scheduling a mammogram (could the postcard reminder I received in September be right – didn’t I just have one?) and getting my oil changed. (Yes, I realize oil should be changed more often – baby steps.) It is usually not until someone asks me about my resolutions that I quickly throw some out to the world….umm, eat healthier, start a budget, don’t over-schedule myself…basically the same things I have been saying and not doing for years. Well last year, I was convinced by a group of girlfriends to try a vision board. If you don’t know what this is, it means creating a collage of photos and placing it where you will see it daily to inspire you to achieve your goals. Sounded a bit hokie to me but I decided sitting around with girlfriends, having wine and giggling over silly wishes would make up for the crafty, spiritual part of the assignment. What did I have to lose? It was a great night of flipping through magazines together looking for just the right imagery clearly emulating our goals for 2012. Even more fun as the evening progressed and the wine bottles emptied. And, you can always count on girlfriends to see you clearly and provide some honest suggestions you hadn’t even thought of. I came home excited, lighthearted from a night with the girls and ready to give it a whole-hearted try. And true to form, the first couple weeks I looked at it every day. I even knocked off a couple of goals right away. Create some play lists on my phone – check! Organize my closet – check again! January hadn’t even ended and I was rolling through my goals. And then also true to form, it lost my attention as I was side-tracked by other things. That is until two days ago when I got the email that it was time to meet, share what came true, and make a board for 2013. Yikes! I couldn’t even remember what was on mine. I also knew some of the other girls really nailed theirs. (It is a bad sign when you remember other’s goals more than your own.) For example, one girl had visions of meeting someone, falling in love and getting married. I remember thinking, shouldn’t she just start with the meeting someone this year? Well I was proven wrong. She got married a month ago. The pressure was on. 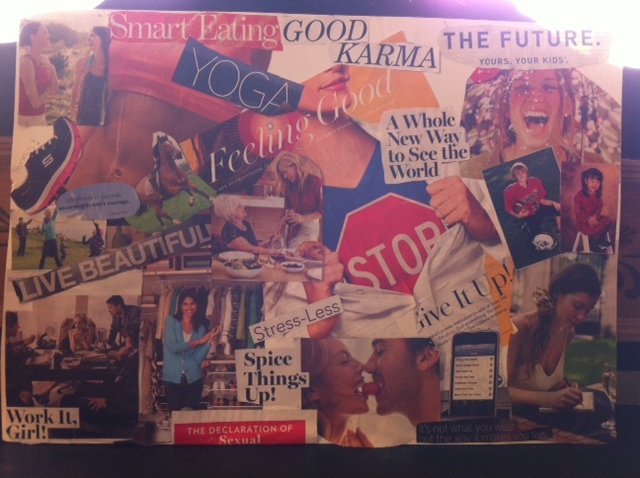 Especially since, I seem to look at even vision boards as a competitive sport. I dug through my closet and pulled out my board to see how I did. Tennis – check! I took two lessons with Stormy. Concentrate on career – big check! I got a new, higher-level job. Yoga – check! I took a few classes. Start writing – Now that’s interesting, I totally forgot about putting that on. The blog has to count. Check again! “Stop” – unaccomplished. A word I get told once in awhile when my mind is whirling and over analyzing (when I am caught in a loop) to remind me it is all in my head. That one may need to move to this year’s board, along with the stomach I wanted and haven’t achieved. Actually, I don’t like that word and my head won’t stop – I am who I am. That one won’t move forward to a new year. I don’t need to fail two years in a row. Overall, I was a bit shocked to discover how many of the forgotten things on the board had actually become part of my year. Perhaps it is like a horoscope that you can always twist to make things mentally fit your scenario. This year, I am not sure what to put on my board (besides the perfect stomach). Maybe, simply the picture of the woman smiling in the rain. I put her on last year’s board because she looked so happy. Not just content, but joyful. Perhaps this year it is as simple as figuring out what things bring that joy to me. And finding ways to fully enjoy those things (and STOP continuing, worrying about or analyzing those that don’t). I’ll share my 2013 board next week. If you have some good ideas for my board I’d love to hear them, especially a few that I can knock off quick. I also just snatched up a Living Social coupon for a private horseback lesson giving me one more check for my 2012 board. I have always worked best under pressure! This entry was posted in Uncategorized and tagged goals, new years, resolutions, vision board. Bookmark the permalink. Hmmm. It occurs to me, KitKat, that your “Stop” and my “Don’t overthink things” are essentially the same resolution!! !